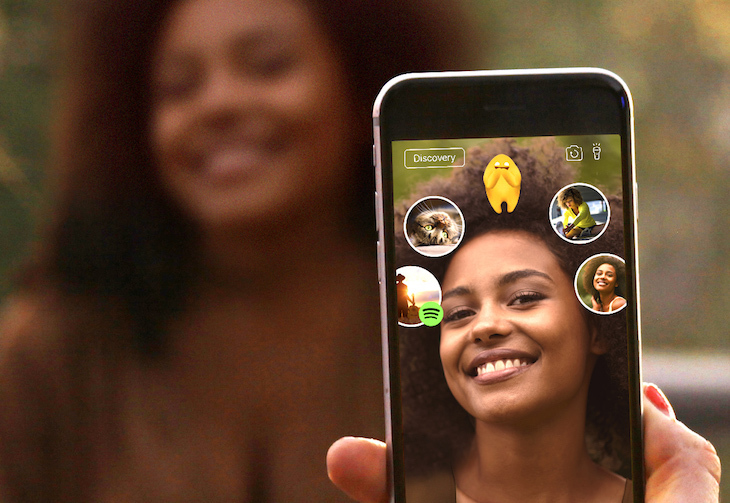 Augmented reality startup Blippar today announced a new social feature for its image recognition app that lets users build an AR profile using facial recognition technology. Called "Halos", the feature offers users the ability to scan their face into the app and fill various bubbles around their head with personal details, such as their latest tweets, favorite songs on Spotify, YouTube videos, and animated emoji. Once the facial profile is uploaded, anyone who "blips" the user – or scans their face with the app – sees the information as a halo of bubbles suspended in mid-air. The feature builds on the app's Public Figure Facial Recognition, introduced last December, which lets users scan 370,000 famous faces to learn interesting facts about them. The Blippar app generally relies on users aiming their phone camera at everyday objects, products or images and "blipping" them to unlock helpful information, interact with brands, play videos, games, music, and more. Blippar said in a blog post that the mobile app is mainly its way of showcasing technologies for other companies interested in adopting their visual search engine APIs – or in this case, facial recognition tech, which the company claims has more than 99.6 percent accuracy. "Our faces are our most unique and expressive form of communication. Through AR Face Profiles we are making the face accessible in digital format for the first time, providing an innovative and dynamic way of expressing ourselves and discovering more about those around you. The technology lends itself to many other forms of implementation, and we are delighted to be able to share our APIs and technology with other companies, who like us, are committed to spurring on innovation in their own industries." Apple has previously snapped up smaller companies specializing in facial recognition and augmented reality technology – two tentpole features expected in the so-called "iPhone 8" due to launch later this year. In February the tech giant bought Israeli firm RealFace, whose proprietary IP could be used to power facial authentication in the upcoming phone, with Apple's ARKit developer platform likely to be used to showcase the handset's next-generation augmented reality capabilities. To be able to recognise people's faces could be an amazing ability to have. I use my phone already to work out when I should move. Eat and sleep. It all works great and my brain saves lots of energy by not having to think for itself. This app will help it save even more energy and I can use that energy to look on the internet for more apps to help me think for myself even less than I do now. Which is already very little as it is. So that's a good thing then isnt it? Isn't it?